You are currently browsing the category archive for the ‘Chocolate’ category. 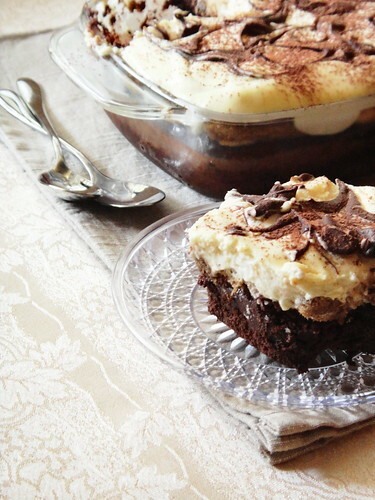 Combining the best of both worlds, this heavenly dinner time dessert by Paula from Enjoy Dessert has a rich brownie base layered with coffee soaked ladyfinger biscuits and fluffy mascarpone cream. 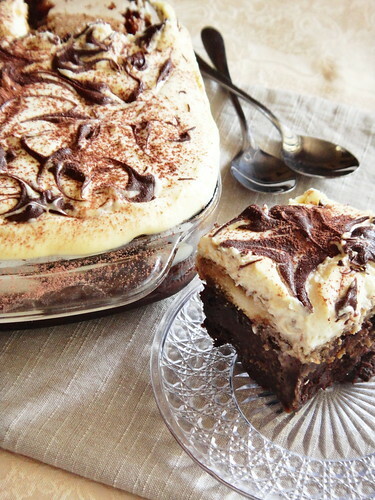 Brownies have been on my baking list for more times than I care to remember and tiramisu is something I no longer need a recipe for, yet I have never paused to give a thought about how these two will pair up until they became famous on food blogs. 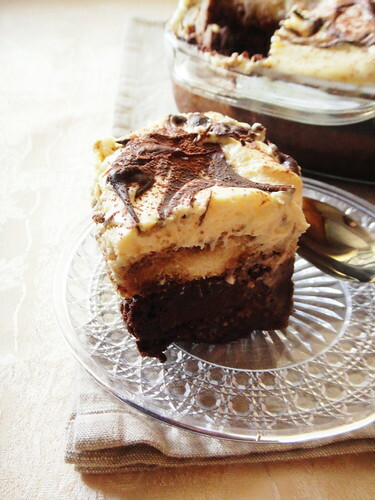 The subtle coffee kick nicely offsets the intensity of dark chocolate and if you are patient enough to allow the brownie and tiramisu layers to meld together overnight, you will probably thank yourself [and me!] afterwards. 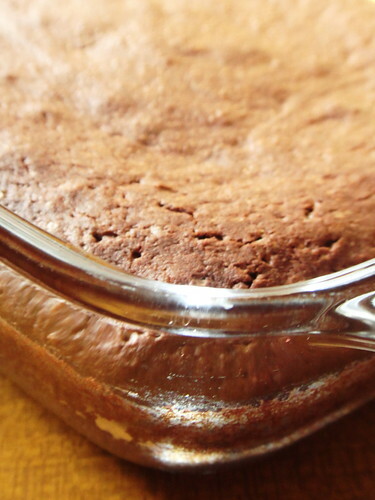 For the brownie, melt the chocolate along with butter over low heat in a thick bottomed saucepan. 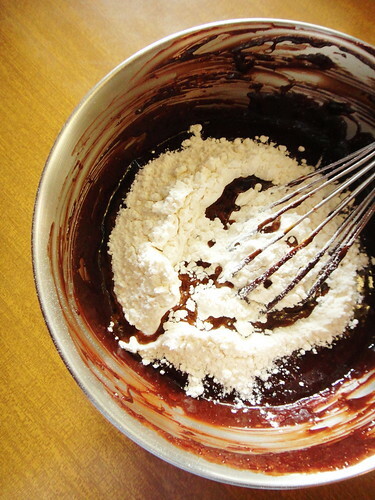 When the mixture is homogeneous, remove it from heat, add sugar and cocoa and mix thoroughly. 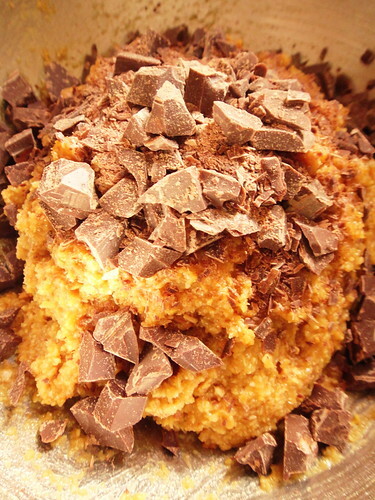 Combine the all purpose flour with baking powder and salt in a large mixing bowl and set this aside. 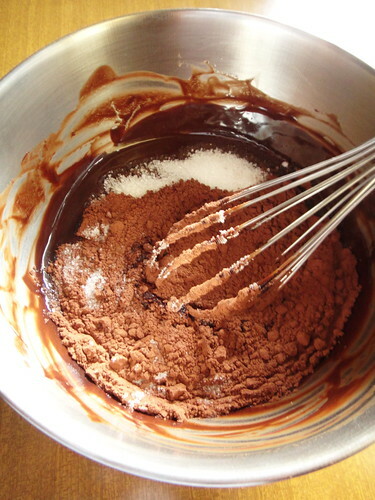 Add eggs, one at a time, to the chocolate mixture and mix well after each addition. Then add cream. 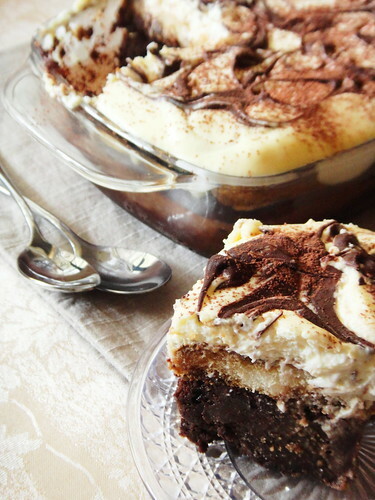 Stir in amaretto and coffee. Carefully fold in flour mixture till no flour streaks remain. Do not over mix. 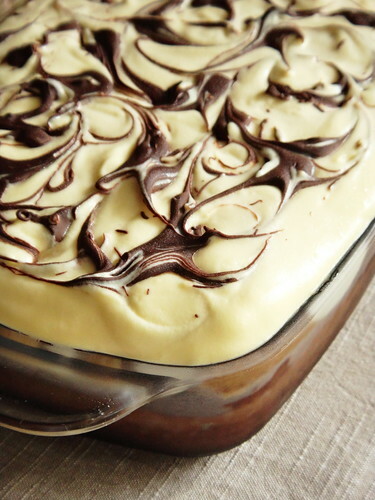 Preheat oven to 180 degrees and line a 20×20 cm baking tray with parchment paper. Pour in batter. Level the surface with a spatula and bake for 20 to 23 minutes. Check for doneness with a toothpick. 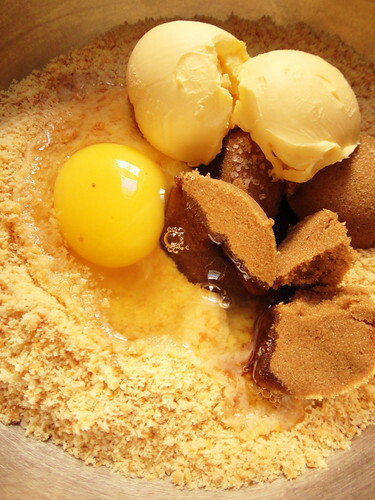 Remove cake from oven and let it cool in pan. Prepare coffee for soaking biscuits and leave to cool. Add rum, amaretto and vanilla extract to cooled coffee. 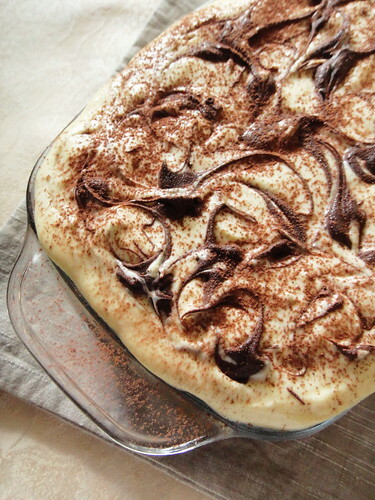 For the tiramisu layer, beat the mascarpone. 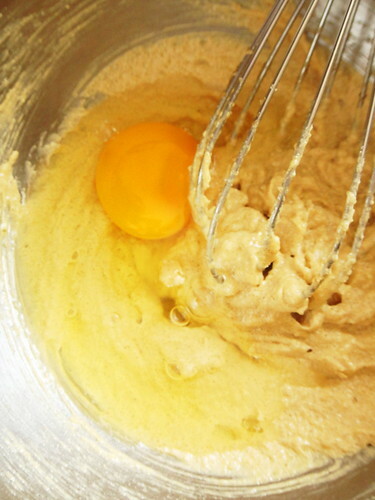 Beat egg yolks with sugar until they turn white in color and doubled in volume. 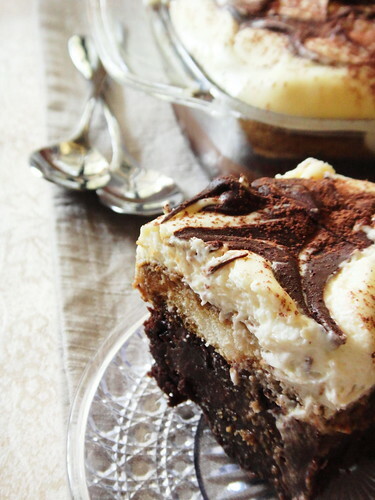 Fold into mascarpone. 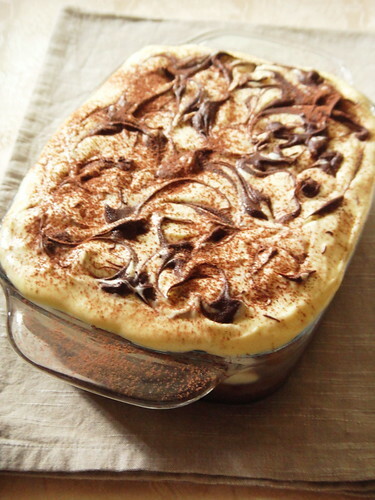 Beat egg whites with salt until stiff and carefully fold into mascarpone cream and chill for 30 minutes. 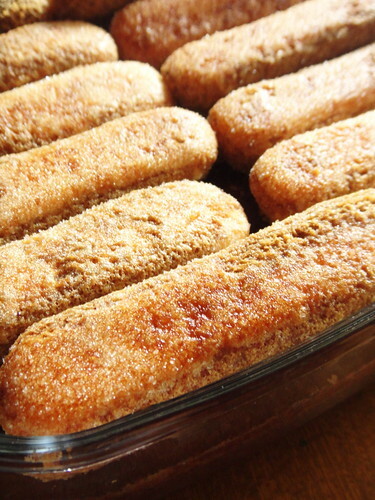 For the assembly, dip ladyfinger biscuits in coffee mixture and arrange neatly over the brownie layer. Spoon mascarpone cream over biscuits, chill for few minutes. 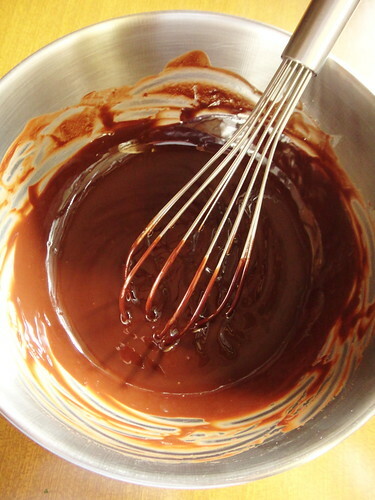 Melt dark chocolate over a bain marie. Bring to room temperature so that it is still fluid. 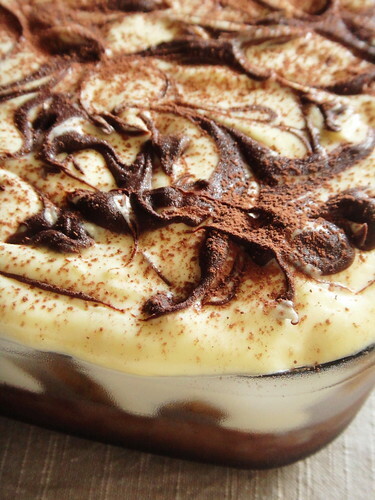 Drop teaspoons of the chocolate over mascarpone. 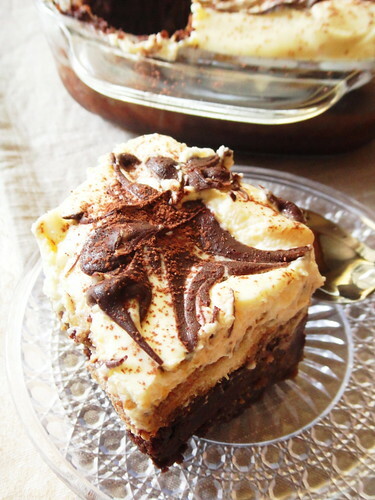 Run a knife lightly over cream to give marbled effect and return cake to refrigerator. Chill overnight. 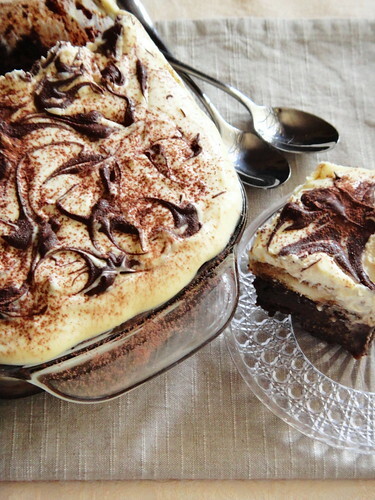 Dust the tiramisu brownies with extra cocoa powder. Cut into squares and serve. Makes 20 servings. Here’s a cute gluten-free recipe for all my friends who cannot tolerate this particular protein in their diet. 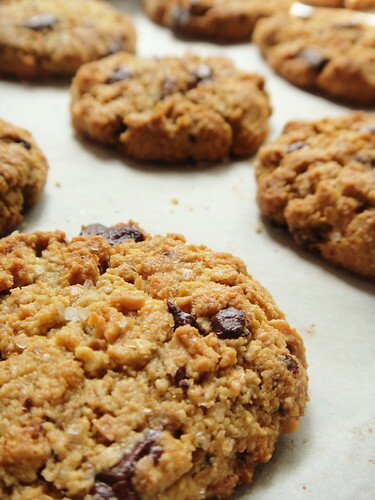 Cookies are loved by one and all and there is no reason anyone should miss out on them. 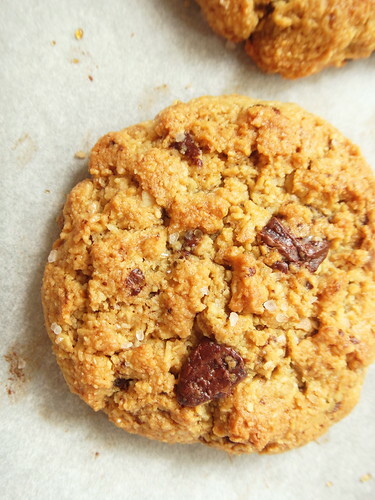 These ‘healthy’ almond chocolate chip cookies from King Arthur Flour use coarse almond meal instead of wheat flour making them 100% gluten free. 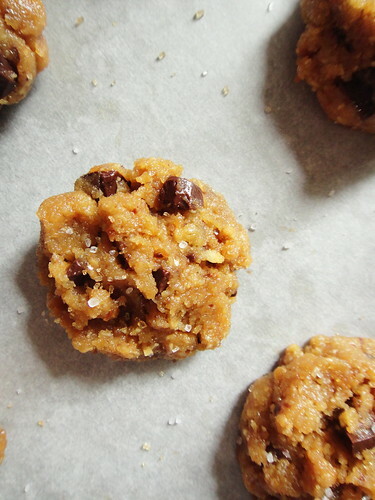 I would recommend making an extra batch and storing it in the freezer for ’emergencies’! Preheat the oven to 350°F. Lightly grease a baking sheet, or line it with parchment paper. 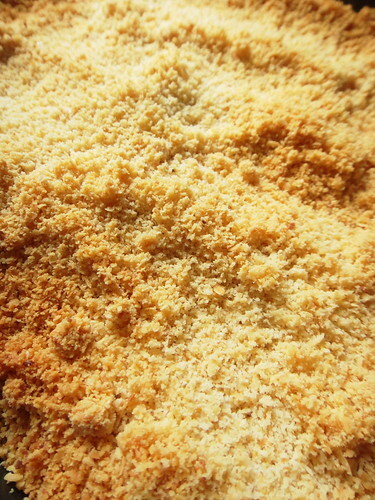 Combine brown sugar, baking soda, salt, and butter in a large bowl and mix until smooth. 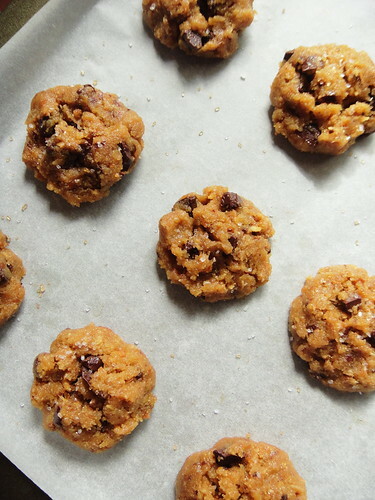 Mix in vanilla, egg, and almond flour. Stir to combine scraping bottom and sides of bowl. Mix for 1 minute at medium speed. Stir in chocolate chips so that they are well distributed. 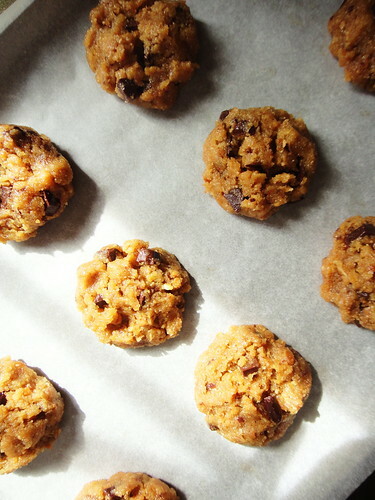 Scoop the dough with a scoop one level tablespoon at a time onto prepared baking sheet. Gently flatten to about 3/8″ thick. 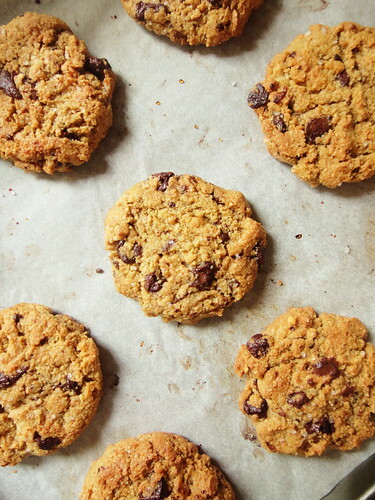 Bake the cookies for 9 to 12 minutes, until golden brown. 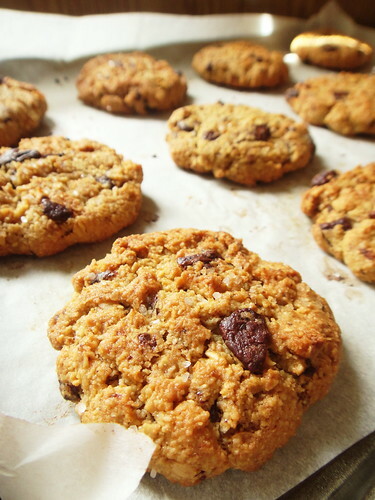 Remove the cookies from the oven and allow them to cool on the pan for some 2 minutes. Transfer them to a rack to cool completely and store in an airtight jar. Yields 14 cookies. 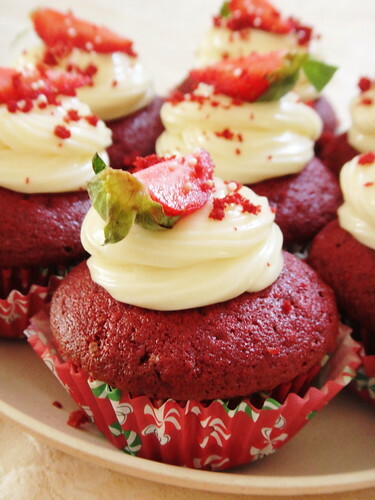 I know that Valentine’s day calls for chocolate but I could not help sharing these cute red velvet cupcakes from The Recipe Critic. 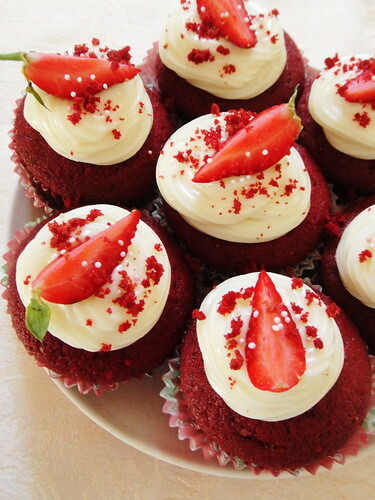 With a generous swirl of cream cheese frosting, they match perfectly with the red coloured theme of the day. 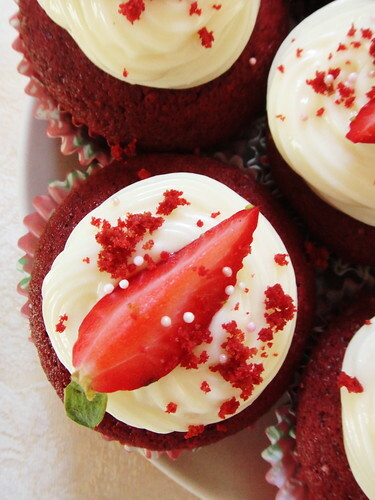 While its popularity is gaining momentum in our chic and ridiculously expensive coffee shops, the red velvet cupcake is an easy 2-bowl recipe to make and enjoy at home. 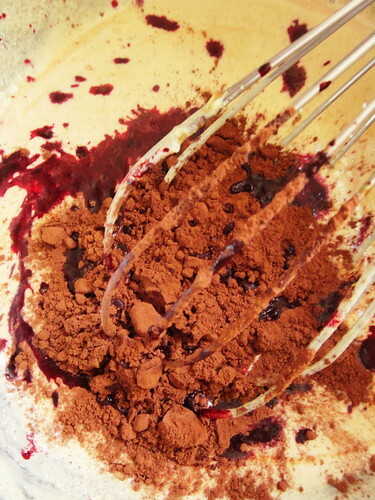 Its beautiful red colour comes from the reaction between the small amount of cocoa powder, buttermilk and vinegar, though it is now being enhanced with natural dyes or synthetic food colouring. Preheat oven to 350 degrees. Line a muffin tin with paper liners and spray with cooking spray. 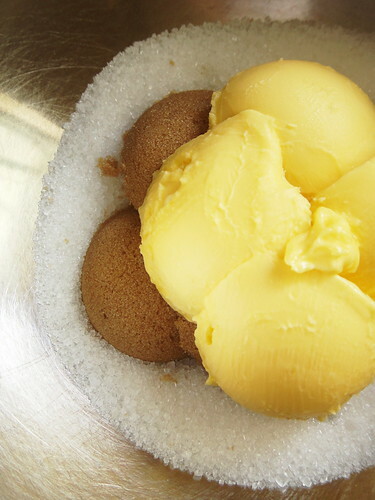 In a stand mixer, combine butter and sugar and mix until very light and fluffy, about 5 minutes. Add eggs, one at a time, beating after each addition. 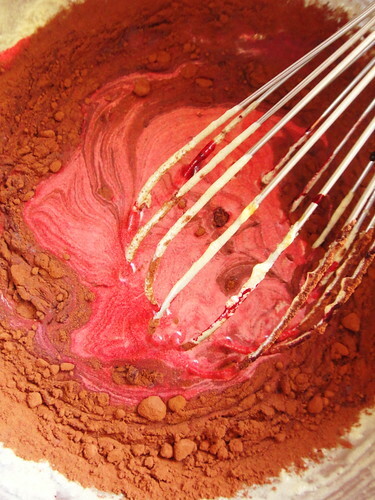 Whisk coloring, cocoa and vanilla together. 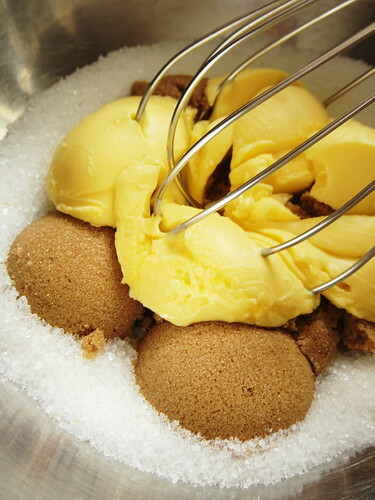 Add to butter-sugar mixture and mix well. Stir salt into buttermilk and add to batter in 3 parts. 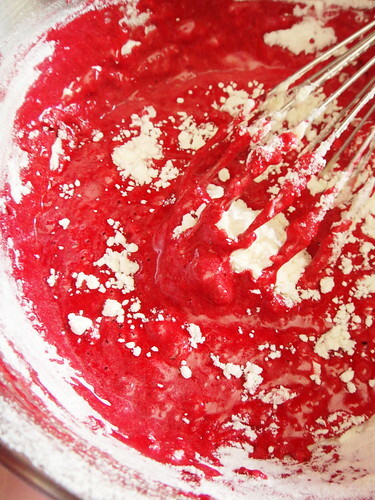 Alternate with the flour, starting and ending with flour. In a bowl, stir vinegar and baking soda. 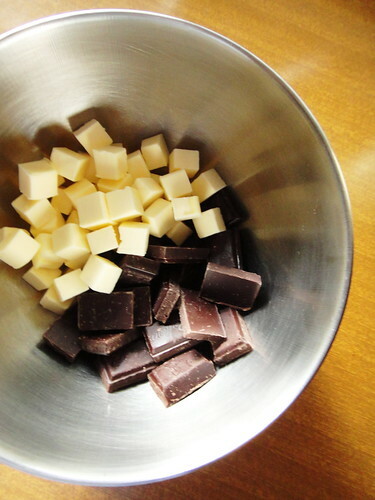 Add to batter and mix well. 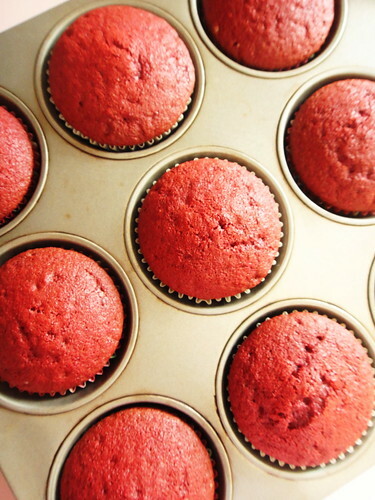 Fill cupcake liners 2/3 full with batter and bake in preheated oven. 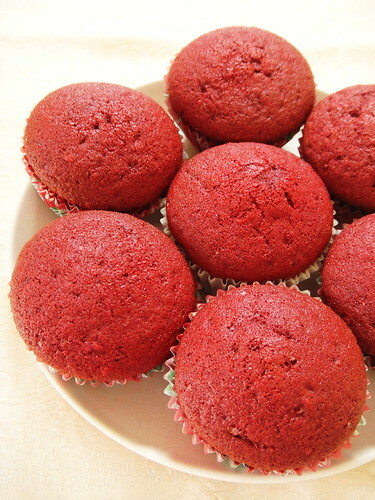 Bake for 17 to 18 minutes until a toothpick inserted in the center of cupcakes comes out clean. 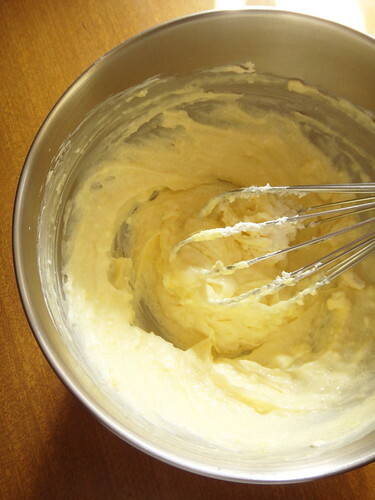 For the cream cheese frosting, mix together butter, cream cheese, salt and vanilla until smooth. Add sugar, 1 cup at a time, beating well after each addition. Pipe a swirl on top of each cupcake. 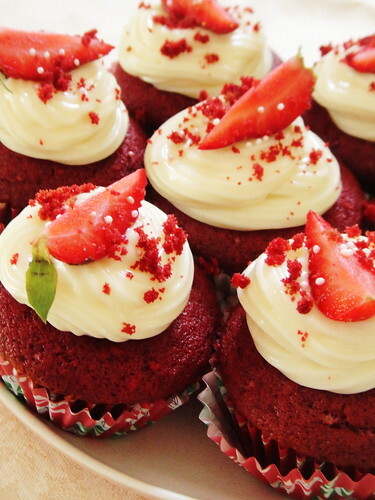 Cool the cupcakes completely and top with cream cheese frosting. Makes 3 1 /2 dozen cupcakes.